In some states it is illegal to offer dietary advice without the government's permission. Florida resident, military spouse and health coach Heather Kokesch Del Castillo learned first hand how far state's will go to protect their cartelized industries. In this instance, she ran up against the Dietetics industry and the state was willing to censor her. Heather moved from California to Florida in the summer of 2015 after her husband, who is in the Air Force, was transferred to a base in Fort Walton Beach. Heather earned a private health-coaching certification in 2013 from the Institute for Integrative Nutrition. The state of California did not require Heather to become a licensed dietetician to give diet advice to willing clients, but Florida's Dietetics and Nutrition Practice Act defines 'dietetics' so broadly that it inlcudes offering any dietary advice for compensation. The Florida Department of Health first contacted Heather when they conducted a sting operation against her. One of their agents emailed heather pretending to be a man named Pat Smith who was looking for information that could help him personalize a weight loss program. In response, Heather offered him a free consultation and asked for his health history. The agent was not charged for any of the information provided to him and he was not solicited to buy anything from her. Heather does not sell supplements, perform diagnostic procedures, or claim to be a licensed dietetician. Her health coaching practice only involves talking to clients, on an individualized basis, about their food choices for compensation. She helps them sift through information that is already available to the public online. The Florida Department of Health subsquently issued a cease and desist and fined Heather $750 for giving dietary advice without a license. In order to continue her Health coaching service, Heather would have to spend 4 years getting a bachelors in Nutrition Science, complete 900 hours of internships, and pay $200 to take a board certified exam, but Heather has neither the time nor the money it would take to meet the state's requirements and neither does the vast majority of the population. Similar cases have arisen in other states. Perhaps the worst example occured in North Carolina back in 2011 when the Board of Dietetics threatened a paleo blogger with imprisonment if he didn't stop offering dietary advice on his website or even through emails and phone calls. The blogger in question did not even demand compensation for his writing, he was simply offering his experience with different foods and supplements. If talking about food is restricted speech it is not hard to conceive that the government could place more contentious subjects behind licensing barriers. The recent fake news and Russian meddling hysteria, originally orchestrated by the Democratic establishment against the alternative media, offers ample opportunity for state governments to find fertile ground for the censorship of critics via licensing requirements. Trump signed the little noticed Women’s Entrepreneurship and Economic Empowerment Act January 9th, likely at the behest of his daughter, who lobbied for it in congress where it was put on hold in the senate. While the new law seems well meaning and does contain some good provisions, it also gives professional feminists or 'gender advisers' power to dictate foreign aid policy mired in inter-sectional feminist restrictions on the design and implementation of all USAID policies, grants and programs. As the Center for Family and Human Rights noted, it is very ironic that Trump would enact Obama's gender policies, especially ones informed by a radical left-wing cultural perspective that includes the whole spectrum of LGBTQ (and whatever other letters they'll add in the future). It is very likely that he didn't even read the bill and just signed it to make his princess happy. Whether he agrees with the law or not is irrelevant at this point. He approved it; he put his name to it; he owns it now, especially the parts that seem to run counter to his domestic policies. The Obama era gender policies in question are outlined in ADS chapter 205. The document details steps for implementing 'gender integration' through all USAID programs, making gender equality the main focus of all USAID projects, and by equality they don't mean legal equality or equality of opportunity. 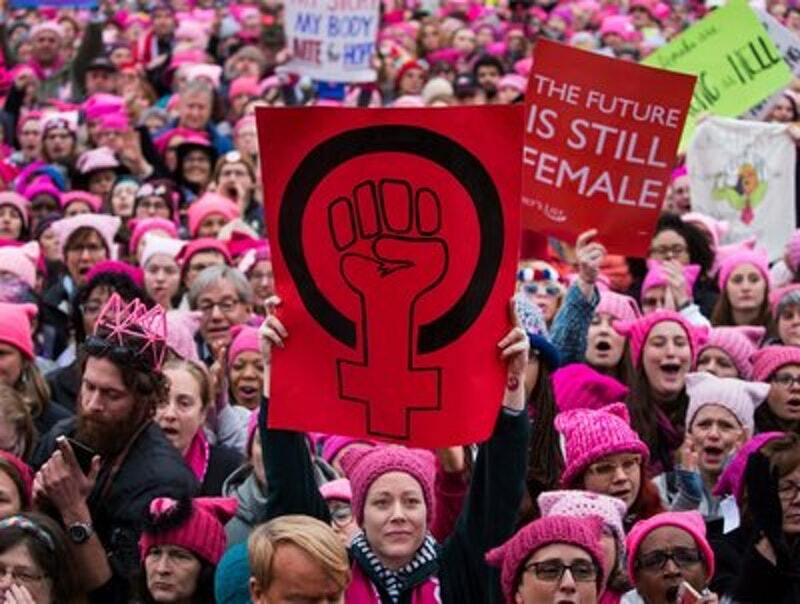 Apparently, the goal is to close gender gaps in status, access to resources, participation in the labor force, and leadership positions, presumably until they are about the same. The Bureau for Policy Planing and Learning, which shapes development policy, is mandated to have a full time gender adviser for this purpose. This could be interpreted in several different ways, but it seems to imply that the goal is equal outcomes between genders, rather than equal opportunities or more practically equal liberty. If they meant to imply equal opportunities or equal liberty they could have made this clearer by wording it different by, for instance, stating their goal was to remove legal and cultural market barriers for women in developing nations; however, this is not the case. It becomes clear that the goal is equal outcomes in section 4 (b), which introduces a gender quota for financial assistance. 50 percent of all small and medium-sized enterprise resources shall be targeted to activities that reach enterprises owned, managed, and controlled by women. However well meaning this may be for women's' empowerment abroad, it will also have the unintended consequence of hurting entrepreneurs in developing countries where women are nowhere near 50% of total small and medium-sized enterprise owners or managers. Hypothetically, lets say a certain developing country x has 20 small and medium-sized businesses in need of financing; 15 of them are owned by men and 5 are owned by women. Under the provision in section 4 (b), we would only be able to provide financial resources to 5 businesses owned by men and 5 owned by women, leaving 10 small and medium sized businesses without assistance. This is especially damaging given the fact that the authors' of this bill own findings that '50% of small and medium-sized businesses, in emerging markets, lack access to formal credit'. Imposing a gender quota on these businesses isn't going to make it any easier for them to get credit through any USAID development program. Source: Miami Herald, Lawns v. Crops in the Continental U.S.
Just yesterday, I toured a garden in my district that is being set up to help educate and empower its community through self-sustainability practices like gardening, Fetterhoff said. Yet in some areas of our state, local governments place arbitrary restrictions on their citizens’ right to provide for themselves using their own private property. It is also worth mentioning that Hermine Ricketts and Tom Carroll made more efficient use of their land by using it to grow vegetables instead of simply growing grass, which consumes more water without fulfilling any basic needs (you can't eat it or sell it at a farmer's market). What Trump was missing in this 8 minute rant was context. Illegal immigration has been declining over the past decade and is at a historic low, but you'd never know that listening to Trump's propaganda about it being a 'national emergency' and his millions of mindless followers. According to DHS, there are around 12 million illegal aliens residing in the U.S., which might seem like a lot and enough to declare a national emergency, but the vast majority of illegal aliens are not new arrivals. 80% of illegal aliens (about 9.6 million) have been here since at least the W. Bush admin when illegal immigration peaked at 470,000 people per year before rapidly dropping off during and after the recession. Not surprisingly, the Bush administration also had the highest number of illegal alien apprehensions in this millennium and was topped only by the Clinton administration in the 90's. There were 3.38 million illegal alien apprehensions between 2004 and 2006 alone. In 2001, the first year of the Bush admin, there were over 1.2 million illegal alien apprehensions. However, this pales in comparison to illegal alien apprehensions in the 1990's, under the Bush Sr. and Clinton administrations, when there were over a million apprehensions every year except 1994 when apprehensions briefly dipped to 979,000 before rising back to 1.27 million in 1995. Illegal alien apprehensions dropped under 500,000 during the Obama administration and has not come close to the 1990's and early 2000's numbers since then. In 2017, Trump's first year, there were about 300,000 illegal alien apprehensions. The number of illegal aliens in the labor force has similarly declined from a peak of 8.2 million or 5.4% of the labor force in 2007 to 7.8 million or 4.8% of the labor force since the end of the Obama Admin in 2016. If Trump is so concerned about illegal immigration, why not remove the incentive to illegally immigrant here? If you'll notice, illegal immigration follows economic trends, rising during boom periods and falling during downturns. Illegal immigration is inextricably linked to the economy, so why not penalize employers who hire illegal aliens and make e-verify, or some other system for checking work authorization, mandatory for all employers? Illegal aliens are less than 5% of the work force, but constitute 24% of agricultural workers, 24% of maids or house cleaning workers and 15% of construction workers and contractors; that should give you a rough idea of where to look first. I'm sure landscaping and lawn care also have a disproportionate percentage of illegal aliens compared to the national average; any industry where people can work under the table is going to be ripe with illegal aliens. This approach would be far more effective than any border barriers. Businesses are much more receptive to laws than illegal aliens. The story of a tree-trimming company, Asplundh, being fined $96 million for hiring illegal aliens and having one their mid-level executives sentenced to prison illustrates the possible disincentives that could be introduced to ensure U.S. companies only hire U.S. citizens, lawful residents, or foreign nationals with work visas. However much Trump and his supporters might want the border wall to be a continuous physical barrier their fantasy will inevitably run into logistical and constitutional problems that will make it a piece meal wall at best. A continuous border wall would be feasible if the entire stretch of the southern border was nothing but flat desert land but it's not. The southern border includes mountain ranges like the Jacumba Mountains, bluffs and canyons like the Rio Grande Canyons, lakes like Lake Amistad, and Peninsular U.S. cities like Los Ebanos, which is enveloped on three sides by the Rio Grande river, that would be cut off from the rest of the country by a continuous border wall and did I mention a certain river that would erode any border wall every time it floods its banks. Of course, geography isn't the only problem for a continuous border wall. Two-thirds of the land along the southern border, mostly in Texas,is owned by private landowners, Indian tribes, and state governments. If we assume the Army Core can easily obtain permission from states, especially Texas, that still leaves unwilling private landowners and tribal governments who are almost unanimous in their unwillingness to allow a border wall. Since the government shutdown, Trump has contemplated declaring a national emergency so he could mobilize U.S. troops and use the DOD budget to build the border wall. He has even floated the insane idea of using executive power to take private land, which is on par with something a third world dictator would do, like Trump's friend Mohammed Bone Saw. In all seriousness, what Trump may be referring to is a declaration of taking, a legal tool established during the great depression to expedite public works projects. This allows the Army Corps or any other federal agency to take possession of private land on the same day that it files a declaration of taking without having to worry about negotiating a price with the private landowner. During construction of border fencing authorized by the 2006 Secure Fence Act, about 360 private landowners refused to voluntarily sell their land to the federal government, resulting in hundreds of condemnation suits some of which took several years to settle. Many landowners were ripped off in the process receiving either no compensation or compensation that was less than the actual land value that was taken from them. An investigation by ProPublica and the Texas Tribune shows that Homeland Security cut unfair real estate deals, secretly waived legal safeguards for property owners, and ultimately abused the government’s extraordinary power to take land from private citizens. Larger, wealthier property owners who could afford lawyers negotiated deals that, on average, tripled the opening bids from Homeland Security. Smaller and poorer landholders took whatever the government offered — or wrung out small increases in settlements. The government conceded publicly that landowners without lawyers might wind up shortchanged, but did little to protect their interests. The Justice Department bungled hundreds of condemnation cases. The agency took property without knowing the identity of the actual owners. It condemned land without researching facts as basic as property lines. Landholders spent tens of thousands of dollars to defend themselves from the government’s mistakes. In theory the 5th amendment guarantees just compensation; in practice, just compensation is a function of how much money you have. As usual, landowners who could afford an attorney to litigate for years were able to get much higher offers for their land that reflected the actual selling price, while those who couldn't were ripped off and forced to settle for the first offer. Retired teacher Juan Cavazos was offered $21,500 for a two-acre slice of his land. He settled for that, figuring he couldn’t afford to hire a lawyer.Rollins M. Koppel, a local attorney and banker, did not make the same mistake. A high-priced Texas law firm negotiated his offer from $233,000 to almost $5 million (21x the original offer) — the highest settlement in the Rio Grande Valley. Of course, there are also landowners who have yet to be paid for their land, having to spend tens of thousands of dollars and several years in court to get a correct appraisal. This was the case for the Los Santos family, who almost had their land stolen outright when DHS paid their ranch hand instead of them. The Loop family spent more than $100,000 to defend their farmland from repeated government mistakes about the size, shape and value of their property. The government built a fence across Robert De Los Santos’ family land but almost a decade later has yet to reach a settlement for it. Ranch hand Roberto Pedraza was accidentally paid $20,500 for land he did not even own. It is also exceedingly difficult to a appraise land values when the government is the only possible buyer and there are very few sales to go by. DHS found a way to circumvent this problem by adding an exception to the Uniform Act, which was supposed to protect landowners from low ball offers, that allowed them to avoid conducting formal appraisals and price negotiations for land worthless than $50,000 before suing the owner.This allowed them to take 90% of the tracts they needed to build the Rio Grande Valley fence without formal appraisals. In place of formal appraisals, the Army Corps used, in some cases, non-certified appraisers, who were not required to abide by federal standards for pricing land, or find a legal description of the property, or determine the property lines or even find the legitimate owner, which in many cases resulted in payments to people who didn't own land. To make matters worse, the Army Core left gaps in the fencing, that are still there today, where they were supposed to install gates for farmers and ranchers to access the rest of their land, making the fence practically useless expect as a water barrier. Unlike private citizens, tribal members are protected from these same thuggish tactics by their sovereign dependent status. For starters, Indian trust land cannot be taken through eminent domain. Trump would need a bill from congress with super majority approval in the Senate and the House, which given the Democratic majority in one and the slim Republican majority in the other, would take an act of God. Many tribes that live along the border such as the Ysleta del Sur Pueblo and the Tohono O’odham, whose ancestral lands occupy 62 miles of the southern border and extend into Mexico, have been vocal in their opposition to the border wall for the potential environmental and cultural damage it could cause. The Tohono O’odham tribe have the most to lose. A border wall would split their homeland in two and separate them from fellow tribal members in Mexico. They currently have low lying vehicle barriers with a gate in a middle that allows them access to their land on the other side of the border. The tribe also maintains watchtowers and helps CBP apprehend human smugglers and drug traffickers that attempt to cross their land. Given their isolation from any urban centers, a 30' wall would be completely pointless because its physically impossible for migrants to get their on foot; most would end up dying of dehydration or exposure in the desert. Sources: Bush's America: Roach Motel, Institute for Family Studies, Pew Research Center, 2010 Census, Pew Research Hispanic Trends, Childtrends.org, World Data on Fertility Rates, Immigration Act of 1924, Eugenic Laws Restricting Immigration, What is the Third Position? The new canard that both illegal and legal immigration from predominately non-white countries, particularly those in Central America, is genocide against White Americans is becoming more commonplace on the right. Even mainstream conservatives like Ann Coulter, Tucker Carlson, and Laura Ingraham have adopted the talking points of the alt-right, formerly known as the third position. Opposition to illegal immigration is understandable given that it has criminal justice implications (e.g. apprehending human, drug trafficking, and social security fraud) and is theoretically nationality and race neutral (e.g. illegal aliens from Poland must also be deported). However, opposition to legal immigration from certain countries is historically rooted in much more malicious intentions. Tucker Carlson's grievances about an influx of Hispanics (mestizos) into a small Pennsylvania town and legal immigrants and refugees from developing countries making the U.S. poorer (and dirtier), which is both historically and economically illiterate for reasons I'll discuss later, highlights shifting conservative attitudes towards legal immigration. Theoretically, the conservative position would be neutral towards Hispanics (mestizos) moving into a town as long as they legally came to the U.S. and contribute to society. The Trump era has flipped this narrative on its head and made it less about work ethic and personal responsibility and more about origin. Some mainstream Trump supporters are starting to echo the biological determinism of the alt-right/third position to make sweeping assumptions about the behaviors of immigrant groups. It is thought that immigrants from Central America (mestizos) and the Caribbean (black and creole) are somehow biologically or culturally prone to vote for big government and welfare dependence, so Trump and some of his supporters want immigrants from countries like Norway, which, ironically, is more liberal and socialistic than the U.S. Given how liberal the Scandinavian countries are compared to the U.S. (e.g. much higher tax rates and more welfare spending not to mention rabid feminism), immigrants from there would likely vote for democrats or even the Green Party, yet I have never heard any third positionists or conservatives argue that Nordics are prone to vote for big government socialism. In fact, the whole of Europe is kind of a counter example to their bizarre belief that whites have an affinity for small government republicanism. That's not true outside of a handful of southern states and even then its only in rhetoric since most deep red states like Louisiana and Mississippi rely heavily on entitlement programs and federal aid. States like Vermont, New Hampshire, Maine, and Minnesota have a much higher percentage of white people than the national average and are also some of the most liberal states in the union. Of course, the same could be said for predominately white states that are also very conservative like Wyoming, North Dakota, Iowa, and Idaho, which only further illustrates that political affiliation isn't some inherit racial trait. The most obvious fallacy in this line of reasoning is that it conflates aggregate population with percentage of population. Although the percentage of white Americans in the U.S.population shrunk from 90% to 62% since 1965(when the national origins quota system was abolished), the total population of white Americans grew by nearly 40 million from 161,750,000 in 1965 to 200 million in 2015, hardly indicative of genocide. Declining white birth rates is also not evidence of white genocide. Birth rates are declining for all ethnic and racial groups so equally absurd claims could be made about black genocide, Asian genocide, and Hispanic genocide. UN Convention 1021 defines genocide as (a) Killing members of the group; (b) Causing serious bodily or mental harm to members of the group; (c) Deliberately inflicting on the group conditions of life calculated to bring about its physical destruction in whole or in part; (d) Imposing measures intended to prevent births within the group; and (e) Forcibly transferring children of the group to another group. The Saudi carpet bombing and Blockade of Yemen could arguably be considered an act of genocide; the forced removal of traditional societies from their native habits, such as the various pygmy tribes from their forests homes by corrupt African governments at the behest of conservation NGOs, could also be considered an act of genocide, but declining birth rates in and of themselves is not genocide. Declining birth rates could be attributed to numerous causes such as wider availability of contraceptives, women delaying child bearing to pursue higher education, and the rising cost of living and growing student loan debt. None of these things are deliberately imposed on white people or anyone by their government. No one is forced to use contraceptives, no one is forced to go to college and take on student loan debt, and no one is forced to live in urban areas where housing and amenities are more expensive. While the average fertility rate for the U.S. (1.76 births per woman) is below replacement level (2.1 births per woman) and has declined significantly in the past decade from 2.08 births in 2007, the phenomenon isn't exclusive to white Americans. Over the last decade, the fertility rate for black women has fallen almost 10% from 2.15 to 1.9 births. The Hispanic fertility rate has fallen the most, dropping 19% from about three births per woman (2.85) a decade ago to 2.1 in 2017. The racial group with the lowest fertility rate also isn't white Americans but American Indians with a fertility rate of 1.62 births per woman (compared to 1.82 births for whites) and just 43 births per 1,000 (compared to 58 births per 1,000 for whites). So while the Hispanic fertility rate is significantly higher than the national average, it is also declining faster than the national average and even if it wasn't it still wouldn't be evidence of a Jewish conspiracy to destroy western civilization. Fortunately, mainstream conservatives lamenting demographic changes have not gone completely batshit and blamed it on a global Jewish conspiracy, but the myth that minority women pump out babies non-stop continues to fuel the narrative that there is an ongoing scheme by 'liberal elites' or 'globalists' to slight white people and to some extent the common stereotype of the welfare queen. There are many benign reasons why minority groups might have higher fertility rates than white Americans. One explanation is that minority groups like Hispanics have a larger portion of young people than white Americans. The median age for non-Hispanic whites is 42.3 years old, while the median age for Hispanics (of any race) is significantly younger at 27.6 years old. Black Americans have a slightly older median age of 32.9 years and Asian/Pacific Islanders are even older at 35.9 years. Minority groups, especially Hispanics also have a larger portion of women in prime child bearing years compared to non-Hispanic white Americans. A full 25% of Hispanic women are between the ages of 20 and 34 compared to only 19% of non-Hispanic white women who are between the same ages. Differences in educational attainment might also explain some of the disparities in fertility rates since non-Hispanic white and Asian women attend college more frequently than Hispanic and black women and thus delay having children for at least four to six years more. The legal immigration of non-whites into the U.S. is also not white genocide. Historically, immigrants have come to the U.S. from poorer, mostly agrarian and often war torn or violent countries in search of better livelihoods. This was true of Irish immigrants who came here after the infamous potato famine and it was also true of Italians and Sicilians who also came to the U.S. in waves from peasant countries at the turn of the century and to a certain extent poles, Slavs and other Eastern Europeans. So it would not be much of a leap to assume that legal immigrants coming from poorer, mostly agrarian and often war torn or violent countries in Latin America and Asia are coming to the U.S. for reasons very similar to those that motivated third wave southern and eastern European immigrants to cross the Atlantic. Legal immigration was also opposed back then by the Eugenics movement for reasons similar to those articulated by their modern predecessors in the alt-right and Trump movement. The supposed intellectual inferiority and criminal tendencies of Italians, Sicilians, Slavs and Eastern European Jews motivated the Immigration Act of 1924 that restricted Italian/Sicilian and Eastern European immigration, through a quota system, to their percentage of the population in the 1890 census. The 1924 immigration law also excluded all Asian immigrants, who were similarly thought to be dull witted and have poor moral character. Fear about the 'browning of America' seems to be driven by similar sentiments about the supposed genetic quality of immigrant groups. Why else would emphasize be placed on skin complexion instead of something more meaningful like culture (Race is more distinguishable by facial morphology than complexion anyway)? If it was about culture it would be called the latinizing of America, but as we already know when people say Latino or Hispanic what they really mean is mestizo because phenotype tends to make a greater impression than country of origin or first language. The emphasize then is really racial purity, but America has never been racially pure even when it was supposedly 90% white. White Americans, especially in Southern states like Louisiana and Mississippi, like mestizo immigrants from Mexico and Central America, have some American Indian ancestry and admixtures from other races; the very origin of the one drop rule was meant to resolve centuries of miscegenation here. The only real consequence of restricting legal immigration is to limit the number of people of a certain phenotype from coming to the U.S. If non-white immigration is considered genocide, then so to should interracial marriage because it also reduces the percentage of white people (by phenotype) in the population. However, I doubt mainstream conservatives lamenting demographic changes will follow alt-right ideology to it's logical conclusion i.e. a return to racial segregation, but they are still equating a lack of authoritarianism and government control over breeding and migration with genocide. The 90% white majority that some conservatives like to reminiscence about was not the result of lassie fair immigration from Europe. As I already mentioned, the immigration act of 1924 excluded immigrants from an entire continent and restricted Italian/Sicilian immigration (considered WOPs until the 1960s) to a mere fraction of what it was between 1900 and 1920. Prior to the 1924 immigration act, average Italian and Sicilian immigration to the U.S. had risen to 216,000 people per year, which is a lot more than the 124,000 legal immigrants that arrive from Mexico each year and had a much greater impact when we account for the fact that the U.S. population was one-third of its current size. Since the National Origins quota system was scrapped in 1965, the Asian American population has grown exponentially from 0.5% of the population in 1960 to about 6% of the population today and are projected to make up 14% of the U.S. population in the next 50 years as well as the largest immigrant group in the U.S. In fact, the rate of Asian immigration has already eclipsed Hispanic (mestizo) immigration. In 2016, more people immigrated to the U.S. from India (126,000) than Mexico (124,000), and immigrants from China (121,000) made up the third top country of origin for the year. Even though the Asian population is growing faster than the Hispanic population and is set to more than double in the next 50 years, none on the right seem to be fear mongering about the 'yellowing of America'. Perhaps prejudice against Indians and East Asians has fallen out of fashion since they cannot be used as a convenient scapegoat for crime and welfare dependency. For one, Asian Americans commit crimes at a lower rate than native whites and on average are more financially successful. However, immigrants from Asia certainly come from poorer and dirtier countries, but they do not, as Tucker's argument would have us conclude, make the U.S. poorer and dirtier as evidence by their over-representation in STEM fields and college graduates. Having a college education helps in this regard, but what Tucker and many others fail to realize is that immigrant labor is generally more productive in developed countries with better infrastructure, a better education system, stronger property rights protections, and less government corruption than it is in third world countries with worse infrastructure, a worse education system, weaker property rights protections, and more government corruption. This is why both seasonal agricultural workers from Central America and software designers from China can earn higher wages in the U.S. and accumulate more wealth than they could in their home countries. 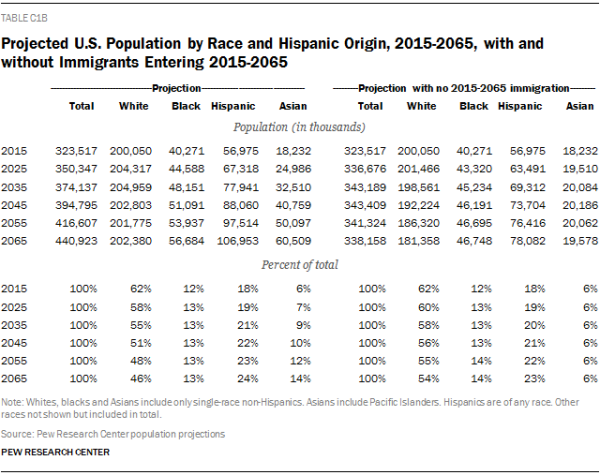 Given historical changes in who is categorized as white, white Americans may not even become a minority in the projected year 2045. Olive skinned Italians from the Mediterranean coast were once considered another race by the Anglo-Saxon majority (some still dispute their white European identity) as were Slavs, Accadians and ethnic Jews; all three are now counted as white in the census. Some Eurasians, Turks, Armenians and Iranians are also considered white by the federal government and by the general populace as long as they don't embrace Islam. The franchise could be expanded to Hispanics over the next few decades thereby nullifying the supposed white minority trajectory. 53% of Hispanics already identify as white, which explains the discrepancy between the supposed white percentage of the population (72.4%) and the non-Hispanic white percentage of the population (62%) in the census. Marriages between Hispanics and non-Hispanic whites and assimilation into the Anglosphere could increase the number of Hispanics who identify as white, maintaining a white majority into the near future (who may or may not vote Republican).